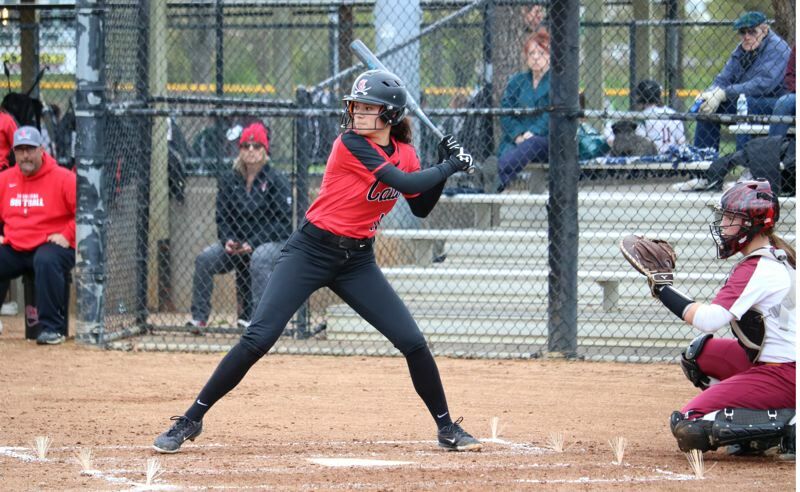 After an up-and-down start to the regular season, look who's starting to play some of their best softball just in time for the start of league play — the Clackamas Cavaliers. Clackamas' Allysa Daniell went 3 for 3 with a double, an intentional walk and two runs scored to help pace the Cavaliers to a 6-1 Mt. Hood Conference road win Friday over Central Catholic at Delta Park in North Portland. Ellie Martin, Kaiya Oswalt, and Maddy Stateler added two hits each and pitcher Shay Monise scattered seven hits with four walks and three strikeouts as the Cavaliers (7-6, 2-0 Mt. Hood) won their fourth in a row. The Cavaliers had a little bit of everything — solid pitching, solid defense, and some timely hitting — as they scored one run in the first inning, another run in the fifth, one in the sixth, and three in the seventh to subdue the Rams (4-9, 0-2). "I think our team is finally starting to come together," said Daniell, the junior first baseman. "We're starting to gel nicely and I think that's why we've been so successful lately. "We're all doing our job at the plate, we're all doing our job backing up Shay in the field, and I feel like we're just coming together really well." "Not what we wanted, but it's early," Rams coach Sara Stauffer said. "We have a good ball club that I think will surprise some people. "We always talk to the players about how we can compete with anybody … it's just getting over that hump and some of those mental hurdles." One of the issues holding back Central Catholic recently has been a lack of offense — no more than one run in six of their last eight games. The Rams had their chances Friday, but went 1 for 7 with runners in scoring position, and of the eight runners left on base in the game, six were stranded in scoring position. "We just didn't have the right mentality at the plate today," Stauffer said. "We talk about being a lion or a rabbit at the plate. And I think in those situations, we became a little scared and a little rabbit where at that point we wanted them to be lions." Clackamas took a 1-0 lead in the first inning when Stateler singled with one out off Central Catholic starter Ally Hyde and came around to score when Rinoa Ainger grounder that the Rams misplayed into an error. The Cavaliers added to their lead in the fifth after Daniell hit a two-out double to the gap in left-center field and then scored on Monise's single to right, making it 2-0. Monise, the Cavs' starting pitcher, took a four-hit shutout into the home half of the fifth when Central Catholic's Princess Mason hit a leadoff single and then scored from second of Bri Perkins' two-out single to center. Clackamas made it 3-1 in the sixth when Oswalt doubled to center with one out and then Martin, the Cavs' No. 9 hitter, drove the first pitch she saw from Hyde to the fence in straightaway center for an RBI-double. In the seventh, the Cavs sent nine batters to the plate and scored three runs on two hits, two walks, and one hit by pitch. Oswalt had the final blow with a bases-loaded single to right that scored Daniell, making the score 6-1. The Rams put two runners in scoring position with one out in the seventh, but came away empty when Kimberly Pulido lined into a game-ended 6-4 double play. "I'm happy with it," Clackamas coach Ken Gemma said. "We'll just keep building from here. We had a rough patch in California over spring break, but I think we're steadily climbing the ladder now since we've gotten back and we're starting to get into league." Of course, there is always room for improvement, even for teams on four-game win streaks. "We still aren't putting a whole game together offensively," Gemma said. "I think we played OK defensively and maybe misread a couple of balls, but we're starting to gel a little bit."